Tetiaroa is comprised of a dozen idyllic islands surrounding a spectacular lagoon. Tetiaroa has always been a place of stunning beauty, tranquility and rejuvenation — first for Tahitian royalty, who chose this island above all others for their summer retreat, and later for Marlon Brando who chose it for his personal sanctuary. With access provided by private plane, the resort offers carefree luxury in the midst of pristine nature. The all-inclusive resort features 35 deluxe villas each with its own private beach area and plunge pool, restaurants showcasing Polynesian and French cuisine, a luxurious Polynesian spa, a lagoon-view bar, beach bar, pool, organic garden, library, boutique and watersports. The Brando is unique in concept and scope, combining environmental purity, luxury and Polynesian charm into an enriching experience. The interior of the villa has been designed to enhance the serenity of the surroundings, with the feeling of the indoors and outdoors merged together. Pass beneath a covered porch and stroll the boardwalk that leads to the front door. Enter into a cozy sitting room in tasteful shades of ecru and taupe, furnished with soft and comfortable chairs and sofas. To the side is a media room to listen to music and watch movies on the TV/VOD. WiFi & Blue-tooth is accessible throughout the villa and its exterior sun decks. A walkthrough dressing area adjoins the spacious bedroom, where a king-size bed invites you to relax and gaze through a large window at the lagoon, visible through a screen of pandanus, miki miki, and coconut trees. The adjoining bathroom features an outdoor bathtub,set behind a wooden screen. The living room also provides a private dining area with seating for six, a kitchen for the resort’s Chef to use for private functions for villa guests, and a wide entryway onto a large, two-tiered deck. In these villas, the second bedroom is situated directly above the first. The downstairs bedroom features a private dressing area. Upstairs, as you gaze out over the lagoon, you’ll experience a sensation of floating above this opulent tropical vista. This bedroom also features its own dressing area, bathroom, and outdoor bathtub. Outside, the villa’s 1,658-sq.-ft. private yard has a larger deck area and 140-sq.-ft.plunge pool. 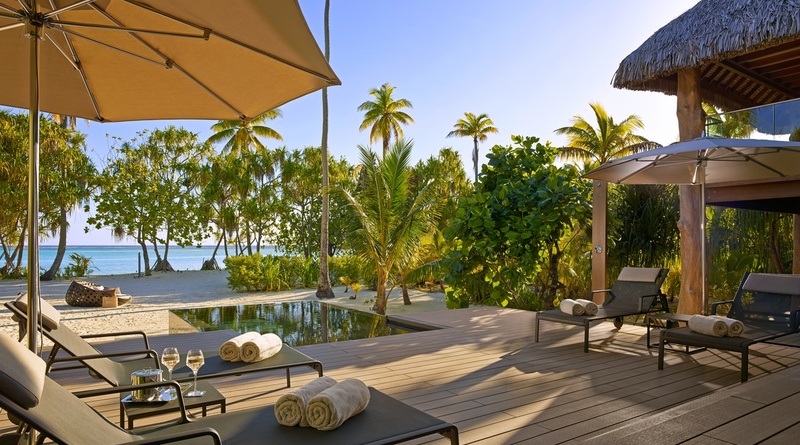 The Brando Resort is located on the motu Onetahi that was once the favored retreat of Tahitian royalty. Honuea, at a short distance and easy to reach by outrigger canoe... or by foot will seduce you with its white-sand beaches bordered by a shallow water of a crystalline lagoon. The largest of the motus is Tiaraunu with an abundance of coconut palms. On the north part of the lagoon are Tauini, Tauroa & Hiraanae, separated from each other by a little hoa (breaks in the coral reef) on this location you will meet the lemon shark nurserie. Oroatera is an island at paradise with spectacular beaches and a lagoon along with a seahorse-shaped pond which spawned an ancient legend. The smallest of the 12 motus is Aie. The islets of Tahuna Iti & Tahuna Rahi are the sanctuaries for birds such as red-breasted black frigates, phaetons, brown gannets, and other petrels. The only motu that has preserved its primitive rain forest is Reiono also the wilderness home for Kaveu (coconut crabs). The first motu inhabited by europeans, Rimatuu was once a coconut plantation islet with its own village and a dock.